Experience the Nile Valley’s ancient highlights without the expense of a cruise on this door-to-door Luxor tour. On day 1, travel to Luxor by way of Kom Ombo and Edfu for an afternoon tour of Karnak Temple and an evening tour of Luxor Temple. After breakfast at your hotel, tour the Valley of the Kings, the Temple of Queen Hatshepsut, and the Colossi of Memnon before transferring to the airport. At 8:00 am your tour guide will pick you up from your hotel in Aswan to enjoy a day tour to the Temple of Kom Ombo standing on high grounds overlooking the Nile. It differs from other temples because of its double entrance, each one is dedicated to divinity: "Haroeris" with his falcon head and " Sobek " with his crocodile head. The Temple of Kom Ombo was built on the honor of two deities the crocodile-headed Sobek, god of fertility and creator of the world, and Haroeris or the ancient falcon-headed Horus. A lunch box included. After enjoying lunch you will be transferred to Edfu by road to visit the majestic temple dedicated to Horus which is considered by most to be the best preserved cult temple in Egypt. According to the Egyptian myths, it was the place where the falcon-headed god Horus revenged the murder of his father Osiris by killing Seth. Arrive in Luxor around 14:00 and start your tour visiting Karnak Temple the greatest example of worship in the history, dedicated to the God Amon, his wife Mut and their son Khonsu. Spend around 3 hours there then transfer you to Lotus Nile Hotel for check in and take some rest before your evening tour. Around 18:00 pm you will be picked up from your hotel by your expert tour guide to start your evening visit to Luxor Temple, it was built by Amunhotep III in 18th Dynasty in the New Kingdom and it was completed by Ramesses II during the 19th Dynasty. Later you will be driven back to your hotel in Luxor. Have breakfast in the hotel and around 7:00 am be picked up from your hotel by our expert tour guide to start your day tour visiting the West Bank where you will visit the Valley Of The Kings, the magnificence of the grandeur of architecture which was used for burial, there are many kings buried in this valley. The most known tombs are King Tutmosis I, Tutmosis III, Tut-Ankh-Amon, King Ramssess VI, King Mrenptah and AmonhotepII. Followed by a visit to the Temple of Queen Hatshepsut that known as El Dir El Bahari which was built by Queen Hatshepsut the daughter of Thutmosis I, who ruled Egypt about 20 years during the 18th Dynasty (approximately 1490-1469 B.C), the only pharaonic woman who reigned ancient Egypt. 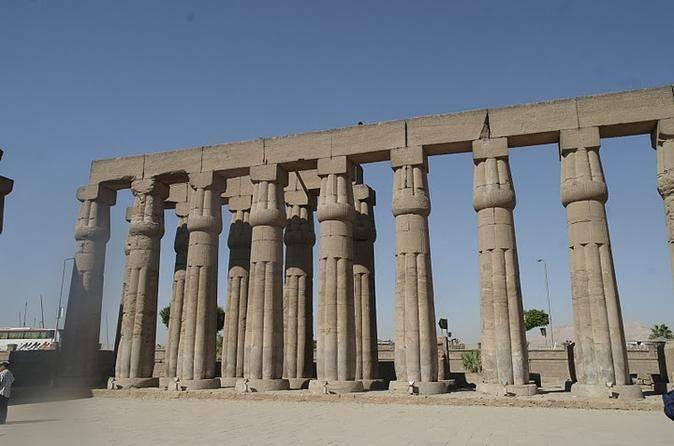 Then continue your day tour to the Colossi of Memnon which are remains of the mortuary temple of Amenhotep III around 12. In the afternoon be transferred to Luxor Airport to end your tour.